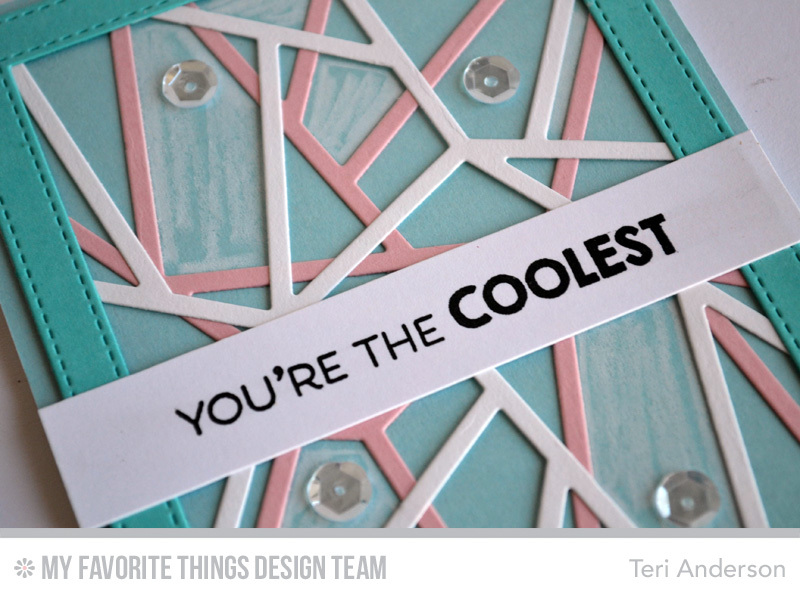 MFT Countdown: 3 | A bit of this. A bit of that. Woo-to-the-hoo! It’s another day of counting down toward the June release from My Favorite Things. And I’ve got a couple more things made with the new stuff. On your mark. Get set. GO! Say hello to Card #1. I have been having a ton of fun playing with the new Abstract Cover-Up Die-namics. It’s just a super fun background to use on cards and stuff. For this one, I cut it five times (in a rainbow assortment of cardstock colors) and then stacked them up, slighting offsetting them as I adhered them to my card. It allows you to see just a bit of that rainbow. And for giggles, I used a white pencil to doodle some random designs randomly into the design. I think it turned out pretty fun. I again used that fun Abstract Cover-Up Die-namics die. This time, I cut it out twice. I adhered one to a frame cut with the Stitched Rectangle Frames Die-namics. It was a perfect fit. Then I took a second Cover-Up, flipped it over and adhered it the frame too. This is how it looks when you flip the frame over. After I adhered the frame to my card, I once again whipped out my trusty white pencil. I added a little bit of color into some of the openings. It’s a lot softer with the blue cardstock than the black, but it still adds a nice finishing touch. I wanted to make something a little more on the classy than graphic side here so I whipped out the new Lace Background stamp and stamped the background. Then I added some layered elements (squares cut with the Zig Zag Square STAX Die-namics and a flourish cut with the Pierced Fancy Flourish Die-namics). Even though I added some sequins to this card, it is fairly flat. Alright! So that what I have for you today. For a list of MFT products I used on my cards today, check out the list below. 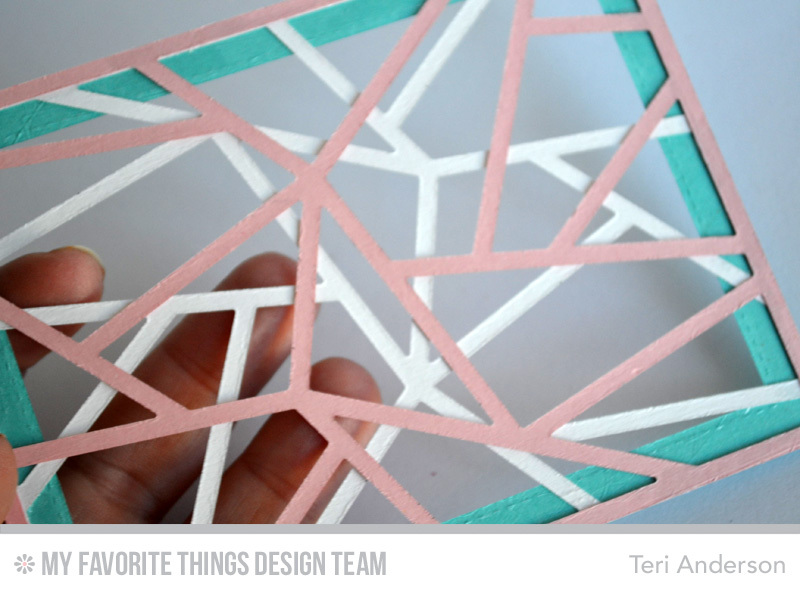 And be sure to stop by the MFT blog to see who else from the design team is sharing cool new stuff today. All of these cards are just gorgeous! Thank you for sharing. Hello fun scribbled cards…. bonjour Lace background!!! OOOO la la! 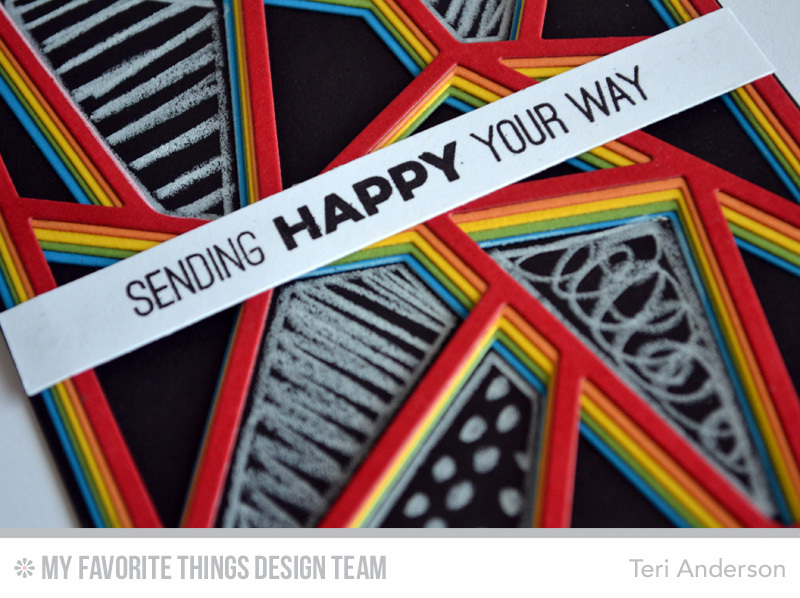 Great cards Teri and a lot of creativity here with the abstract die! Wow! All the cards are so beautiful! Especially love how funky the first card is! i love your rainbow and chalk card!!! Great projects! I LOVE what you did with the abstract die.